Abstract: Anemia is a global health problem affecting most developing countries. We examined the prevalence of anemia and its predictors among children under 5 years of age in Arusha District, Tanzania. Random sampling technique was used to identify 436 children aged 6–59 months. Anemia status was assessed by measuring hemoglobin concentration from blood sample obtained from a finger prick and HemoCue® Hb 201+ photometer. Demographic information and dietary intake data were collected using a standardized questionnaire. Anemia cut-off points were defined according to World Health Organization standards for children aged 6–59 months. Logistic regression using backward procedure was used to estimate odds ratios (ORs) at 95% confidence intervals (CIs). Prevalence rate of anemia among under-fives was found to be 84.6% (n=369). 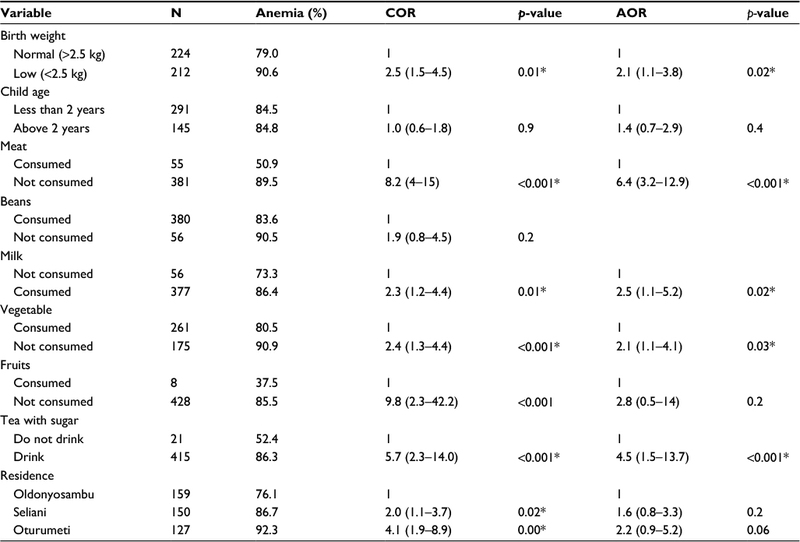 Multivariable logistic regression identified the following predictors of anemia; low birth weight (adjusted OR (AOR): 2.1, 95% CI: 1.1–3.8), not consuming meat (AOR: 6.4, 95% CI: 3.2–12.9), not consuming vegetables (AOR: 2.1, 95% CI: 1.1–4.1), drinking milk (AOR: 2.5, 95% CI: 1.1–5.2), and drinking tea (AOR: 4.5, 95% CI: 1.5–13.7). It was concluded that low birth weight and dietary factors (ie, low or nonconsumption of iron-rich foods like meat, vegetables, and fruits) were predictors of anemia among under-five children living in this rural setting. Community education on exclusive breastfeeding and introduction of complementary foods should be improved. Mothers and caretakers should be educated about nutrition, in general, as well as potential use of micronutrient powder to improve the nutritional quality of complementary foods. Pregnant and lactating women and under-five children are the most vulnerable social groups to micronutrient deficiencies due to their increased needs for vitamins and minerals.17 Along with this greater need comes a higher consequence due to lesser reserves. The literature is replete with nutrition interventions,8 which clearly reveal the “one-off,” cross-sectional nature of most interventions. Stoltzfus18 indicated that effectiveness of such interventions has been inconsistently demonstrated, leading to difficulties in scaling up. Given the significantly high levels of anemic under-five children in Tanzania, there is strong need for action. In order to design and deliver effective interventions, it is important to know the strong risk factors for predicting anemia among under-five children. The intent of this study was to first affirm the baseline prevalence rates of anemia in under-five children in selected wards of the predominantly periurban/rural Arusha District prior to implementation of an intervention to address anemia among the under-five children. Consideration of factors contributing to anemia among under-five children in the specific locations would be essential in order to ensure effectiveness of the proposed intervention. This community-based cross-sectional study was conducted in Arusha Rural District, Tanzania. This District is primarily rural, shares similar socioeconomic patterns with most of the rural districts in Tanzania, demonstrates cultural diversity, and reports childhood anemia prevalence similar to or above national levels.19 Within the district, there are 20 wards, each having at least one reproductive and child health (RCH) clinic for mothers and children. Of these, three wards – Oldonyosambu, Oturumeti, and Seliani – were randomly selected for the study. Inclusion criteria used for subjects’ selection included family residence within the study villages, child(ren) between 6 and 59 months attending a designated outpatient RCH clinic, child(ren) consuming some solid foods (ie, no longer exclusively breastfeeding). Exclusion criteria included child(ren) aged above 60 months, having sickle-cell anemia or currently consuming multivitamin and/or mineral supplements on a regular basis, or the family rejecting participation in the study. The sampling frame was established, and 20 wards with heath facilities offering RCH clinic services were identified and coded from 01 to 20. Three wards out of 20 wards were randomly selected by using a table of random numbers. In the selected wards, parents/guardians with children aged 6–59 months were invited to the selected health facilities for free anemia screening and nutritional status assessment. Children who met the inclusion criteria were selected for the study. A total of 127, 159, and 150 children from Oturumeti, Oldonyosambu, and Seliani, respectively, were selected for the study. A sample size was determined using the statistical power analysis formula n=z2p(1–p)/d2,20 where n = sample size, p = prevalence of anemia (60%) (TDHS, 2010), z = z-value at 95% confidence (=1.96), d = level of significance (=5%), with an anticipated attrition of 18% to follow-up yielded a total of 436 mother–child pairs. Data on a range of socioeconomic, demographic, and childhood-related illnesses were captured using a structured pretested, standard questionnaire at baseline during face-to-face interviews with the parents/guardians. Key elements were: 1) child-information – gender, age, birth weight, feeding practices, and illness 2 weeks prior to survey; and 2) family-specific – socioeconomic and demographic characteristics of parents/family, including education level, marital status, occupation, and ownership of animals and land. This information was critical for determining risk factors for anemia among children and would be essential in planning, implementation, and evaluation of intervention programs for controlling childhood anemia. Analysis of data was done using the Statistical Package for Social Sciences™ (Version 20.0; IBM Corp., Armonk, NY, USA). Frequency, means, and standard deviations were used to describe the characteristics of the study population and to estimate the prevalence of anemia. χ2 tests were used to compare group differences for categorical variables. Univariate logistic regression was performed, and all variables having a p<0.05 were included in multivariate logistic regression model. Using a backward elimination method, a stepwise regression was done to progressively exclude independent variables which had no effect when put together. Association between dependent and independent variables was assessed using odds ratios (OR) at 95% confidence interval (CI). Ethical clearance was obtained from the National Institute for Medical Research, Tanzania. Permission was also obtained from the regional and district health offices in Arusha to conduct the study in the RCH clinics. The purpose of the study was explained to all mothers/guardians of the children, and those who agreed to participate signed an informed consent to affirm their willingness to participate. After screening for anemia, results were shared and discussed with parent(s)/guardian(s). Children found to be severely anemic (Hb <7.0 g/dL) were referred to the medical doctor for treatment because severe anemia usually needs immediate medical attention to treat the underlying causes and restore the normal levels of red blood cells; hence, they were excluded from the intervention aspects of this study. A total of 436 children aged 6–59 months participated in the study. The mean age of participating children was 20.3±10.8 months. About 85% (n=369) had anemia (Hb <11 g/dL) with no significant difference in terms of gender (ie, 81.4% females; 87.2% males). Younger children (under 2 years) were more likely to be anemic compared to their older peers (Table 1). Notes: aMultiple response if the child had two or more diseases (diarrhea, fever, or cough); *p<0.05. Table 2 shows the feeding habits that were associated with anemia. 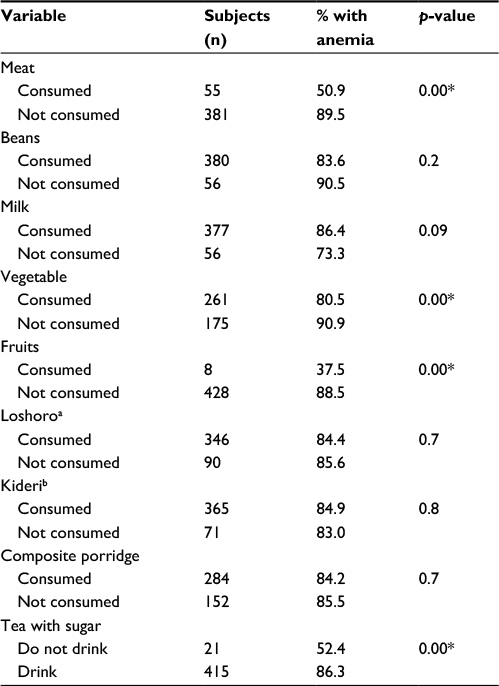 Only 12.6% (n=55) of the children consumed meat, while merely 1.8% (n=8) consumed fruits. These numbers likely reflect a lack of nutrition knowledge on the part of the mothers. Most complementary foods were plant based. The main foods given to the children were thin plain maize porridge and composite flour porridge. The composite flour was obtained from a mixture of finger millet, rice, peanuts, and sardines. Notes: aLocal foods cooked from maize and with mixed sour milk; bmashed banana mixed with sour milk; *p<0.05. Table 3 summarizes factors associated with anemia. Five factors were significantly associated with anemia among the under-five children. These factors were: low birth weight, nonconsumption of meat, vegetables, fruits, and drinking tea with sugar. In multivariate analysis, the following factors remained as independent risk factors associated with anemia: having low birth weight (adjusted odds ratio (AOR): 2.1, 95% CI: 1.1–3.8) nonconsumption of meat (AOR: 6.4, 95% CI: 3.2–12.9), nonconsumption of vegetable (AOR: 2.1, 95% CI: 1.1–4.1), drinking milk (AOR: 2.5, 95% CI: 1.1–5.2), and drinking tea with sugar (AOR: 4.5, 95% CI: 1.5–13.7). Notes: Variables in the model were controlled for gender and age of the children; *p<0.05. Abbreviations: AOR, adjusted odds ratio; COR, crude odds ratio. According to the World Health Organization1 guidelines, MNP which is a single-dose packet of powder containing iron, vitamin A, zinc, and other vitamins and minerals, can be sprinkled onto any semisolid food at home or at any other point of use to increase the content of essential nutrients in the infant’s diet during this period. This is done without changing the usual baby diet. Overall high prevalence rate of anemia among the under-five children was associated with early introduction of nutritionally poor complementary foods and lack of exclusive breastfeeding for the first 6 months of life. Introduction of nutritious complementary foods, such as iron-fortified cereals and meat/meat products, could have highly reduced the prevalence rate of anemia among the children. One of the limitations of this study that may have affected the results is the cross-sectional nature of the study that precludes identifying seasonal patterns. At the time of the study, it was the dry season, which may have also contributed to higher levels of childhood anemia and lower levels of consumption patterns of unavailable/expensive foods. Another limitation of note may relate to the ‘illness status’ of the children. Although the children were outpatient visitors to the RCHs for regular measurements (physiological and anthropometric), many reported an illness in the 14 days prior to their visit. It is recognized that illnesses or treatments of such illnesses (ie, medications for infection, malaria) may in fact cause a mild anemia.46,47 Hence, a future study may control for such confounding factors. The findings of this study affirmed the high prevalence rate of anemia among under-five children in Arusha District which was higher than the previous rate reported by NBS and MACRO.19 It was found that best predictors for anemia among under-five children living in a rural setting were low birth weight and dietary factors (specifically nonconsumption of iron-rich foods like meat, vegetables, and fruits). It was recommended based on this study that community nutrition education, especially on exclusive breastfeeding and introduction of complementary foods, should be improved. Additionally, it is strongly suggested that a multisite, multiyear study be conducted to allow a deeper understanding of the causes and factors most impacting on under-five anemia in Tanzania. This study was funded by the Government of Tanzania through the Commission for Science and Technology (COSTECH). WHO. Haemoglobin concentrations for the diagnosis of anaemia and assessment of severity. Vitamin and Mineral Nutrition Information System. Geneva: World Health Organization; 2011. Black RE, Victora CG, Walker SP, et al. Maternal and child undernutrition and overweight in low-income and middle-income countries. Lancet. 2013;382(9890):427–451. Bhutta ZA, Salam RA, Das JK. Meeting the challenges of micronutrient malnutrition in the developing world. Br Med Bull. 2013;106(1):7–17. Cardoso MA, Scopel KK, Muniz PT, Villamor E, Ferreira MU. Underlying factors associated with anemia in Amazonian children: a population-based, cross-sectional study. PLoS One. 2012;7(5):e36341. Yang W, Li X, Li Y, et al. Anemia, malnutrition and their correlations with socio-demographic characteristics and feeding practices among infants aged 0–18 months in rural areas of Shaanxi province in northwestern China: a cross-sectional study. BMC Public Health. 2012;12(1):1. Schrier SL. Causes and Diagnosis of Iron Deficiency Anemia in the Adult. In: UpToDate, Waltham, MA: Wolters Kluwer Health; 2017. Accessed February 20, 2017.
de Benoist B, McLean E, Egli I, Cogswell M. Worldwide Prevalence of Anaemia 1993–2005: WHO Global Database on Anaemia. Geneva: World Health Organization; 2008. Allen LH, De Benoist B, Dary O, Hurrell R, World Health Organization. Guidelines on Food Fortification with Micronutrients. Geneva: World Health Organization; 2006. Kounnavong S, Sunahara T, Mascie-Taylor C, et al. Effect of daily versus weekly home fortification with multiple micronutrient powder on haemoglobin concentration of young children in a rural area, Lao People’s Democratic Republic: a randomised trial. Nutr J. 2011;10(129). Development Partners Group on Nutrition. Investing in Nutrition for National Growth and Prosperity in Tanzania; 2010. Available from: https://www.google.ca/search?q=DPG.+Investing+in+Nutrition+for+National+Growth+and+Prosperity+in+Tanzania%3B+2010&ie=utf-8&oe=utf-8&client=firefox-b&gfe_rd=cr&dcr=0&ei=tTBNWuqPGPTe8AfTl4zwBg. Accessed January 3, 2018. Tulchinsky TH. Micronutrient deficiency conditions: global health issues. Public Health Rev. 2010;32(1):243–255. Stevens GA, Finucane MM, De-Regil LM, et al. Global, regional, and national trends in haemoglobin concentration and prevalence of total and severe anaemia in children and pregnant and non-pregnant women for 1995–2011: a systematic analysis of population-representative data. Lancet Global Health. 2013;1(1):e16–e25. Foote EM, Sullivan KM, Ruth LJ, et al. Determinants of anemia among preschool children in rural, western Kenya. Am J Tropical Med Hygiene. 2013;88(4):757–764. Heckman J, Samie A, Bessong P, et al. Anaemia among clinically well under-fives attending a community health centre in Venda, Limpopo Province. S Afr Med J. 2010;100(7):445–448. Magesa A, Magesa P. Association between anaemia and infections (HIV, malaria and hookworm) among children admitted at Muhimbili National Hospital. East Afr J Public Health. 2012;9(3):96–100. Simbauranga RH, Kamugisha E, Hokororo A, Kidenya BR, Makani J. Prevalence and factors associated with severe anaemia amongst under-five children hospitalized at Bugando Medical Centre, Mwanza, Tanzania. BMC Hematol. 2015;15(1):1. Arimond M, Wiesmann D, Becquey E, et al. Simple food group diversity indicators predict micronutrient adequacy of women’s diets in 5 diverse, resource-poor settings. J Nutr. 2010;140(11):2059S–2069S. Stoltzfus RJ. Summary: implications for research and programs. J Nutr. 2001;131(2):697S–701S. NBS, MACRO. Tanzania Demographic and Health Survey. Preliminary Findings. DHS Dar es Salaam: National Bureau of Statistics, Dar es Salaam, Tanzania & Macro; 2015. Burger SE, Pierre-Louis JN. How to Assess Iron Deficiency Anemia and Use the HemoCue. New York: Hellen Keller International; 2002. Hallberg L, Rossander-Hultén L, Brune M, Gleerup A. Bioavailability in man of iron in human milk and cow’s milk in relation to their calcium contents. Pediatr Res. 1992;31(5):524–527. Kimanya ME, De Meulenaer B, Tiisekwa B, et al. Fumonisins exposure from freshly harvested and stored maize and its relationship with traditional agronomic practices in Rombo district, Tanzania. Food Addit Contam. 2009;26(8):1199–1208. Nyaruhucha C, Msuya J, Mamiro P, Kerengi A. Nutritional status and feeding practices of under-five children in Simanjiro District, Tanzania. Tanzania J Health Res. 2006;8(3):162. Mamiro PS, Kolsteren P, Roberfroid D, Tatala S, Opsomer AS, Van Camp JH. Feeding practices and factors contributing to wasting, stunting, and iron-deficiency anaemia among 3-23-month old children in Kilosa district, rural Tanzania. J Health Popul Nutr. 2005;23(3):222–230. Kulwa KB, Kinabo JL, Modest B. Constraints on good child-care practices and nutritional status in urban Dar-es-Salaam, Tanzania. Food Nutr Bull. 2006;27(3):236–244. Adu-Afarwuah S, Lartey A, Brown KH, Zlotkin S, Briend A, Dewey KG. Home fortification of complementary foods with micronutrient supplements is well accepted and has positive effects on infant iron status in Ghana. Am J Clin Nutr. 2008;87(4):929–938. Tatala S, Svanberg U, Mduma B. Low dietary iron availability is a major cause of anemia: a nutrition survey in the Lindi District of Tanzania. Am J Clin Nutr. 1998;68(1):171–178. El Kishawi RR, Soo KL, Abed YA, Muda WAMW. Anemia among children aged 2–5 years in the Gaza Strip-Palestinian: a cross sectional study. BMC Public Health. 2015;15(1):1. Levy-Costa RB, Monteiro CA. Cow’s milk consumption and childhood anemia in the city of São Paulo, southern Brazil. Rev Saúde Pública. 2004;38(6):797–803. Wilson C, Grant C, Wall C. Iron deficiency anaemia and adverse dietary habits in hospitalised children. N Z Med J. 1999;112(1089):203–206. Hurrell R, Egli I. Iron bioavailability and dietary reference values. Am J Clin Nutr. 2010;91(5):1461S–1467S. Silva DG, Priore SE, Franceschini Sdo C. Risk factors for anemia in infants assisted by public health services: the importance of feeding practices and iron supplementation. J Pediatr. 2007;83(2):149–156. Persson LÅ, Haschke F, Nestlé S. The Euro-Growth Iron Study Group. Prevalence of iron deficiency in 12-mo-old infants from 11 European areas and influence of dietary factors on iron status (Euro-Growth study). Acta Pñdiatr. 2001;90:492–498. Vanderhoof JA, Kleinman RE. Iron requirements for infants with cow milk protein allergy. J Pediatr. 2015;167(4):S36–S39. Ma Q, Kim EY, Lindsay EA, Han O. Bioactive dietary polyphenols inhibit heme iron absorption in a dose-dependent manner in human intestinal Caco-2 cells. J Food Sci. 2011;76(5):H143–H150. Merhav H, Amitai Y, Palti H, Godfrey S. Tea drinking and microcytic anemia in infants. Am J Clin Nutr. 1985;41(6):1210–1213. Zaida F, Bureau F, Guyot S, et al. 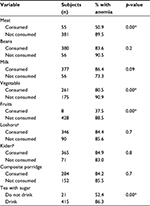 Iron availability and consumption of tea, vervain and mint during weaning in Morocco. Ann Nutr Metab. 2006;50(3):237–241. Nelson M, Poulter J. Impact of tea drinking on iron status in the UK: a review. J Hum Nutr Diet. 2004;17(1):43–54. Dop MC, Benbouzid D, Trèche S, de Benoist B, Verster A, Delpeuch F. Complementary Feeding of Young Children in Africa and the Middle East. Geneva: World Health Organization; 1999:43–58. Olivares M, Walter T, Hertrampf E, Pizarro F. Anaemia and iron deficiency disease in children. Br Med Bull. 1999;55(3):534–543. Amsalu S, Tigabu Z. Risk factors for ever acute malnutrition in children under the age of five: a case-control study. Ethiop J Health Dev. 2008;22(1):21–25. Kalanda BF, Verhoeff FH, Brabin B. Breast and complementary feeding practices in relation to morbidity and growth in Malawian infants. Eur J Clin Nutr. 2006;60(3):401–407. 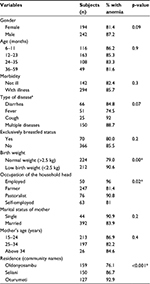 Kidanto HL, Mogren I, Lindmark G, Massawe S, Nystrom L. Risks for preterm delivery and low birth weight are independently increased by severity of maternal anaemia. SAMJ. 2009;99(2):98–102. 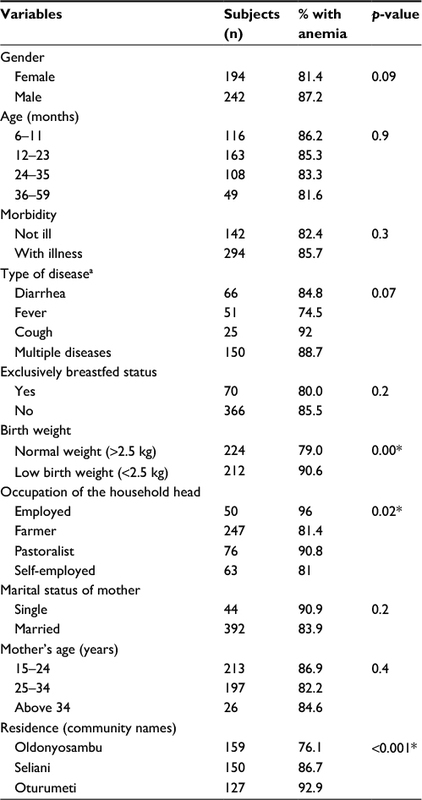 Haggaz AD, Radi EA, Adam I. Anaemia and low birthweight in western Sudan. Trans R Soc Trop Med Hyg. 2010;104(3):234–236. Beutler E. G6PD deficiency. Blood. 1994;84(11):3613–3636. Beutler E. Glucose-6-phosphate dehydrogenase deficiency: a historical perspective. Blood. 2008;111(1):16–24.